I clocked this as one of my best few from the May 14 spawning, back at second selection last summer - and made sure I took a picture of this each time we selected through the koi. In this case study, I lay out the pics up to the latest selection that Amanda and I carried out on 7th February 2015. The red mark on the nose has expanded - at the start of last year I had no experience of seeing how this kind of thing would develop, but now I've seen several examples of it - I've observed that it's far more likely to expand than dissapear. 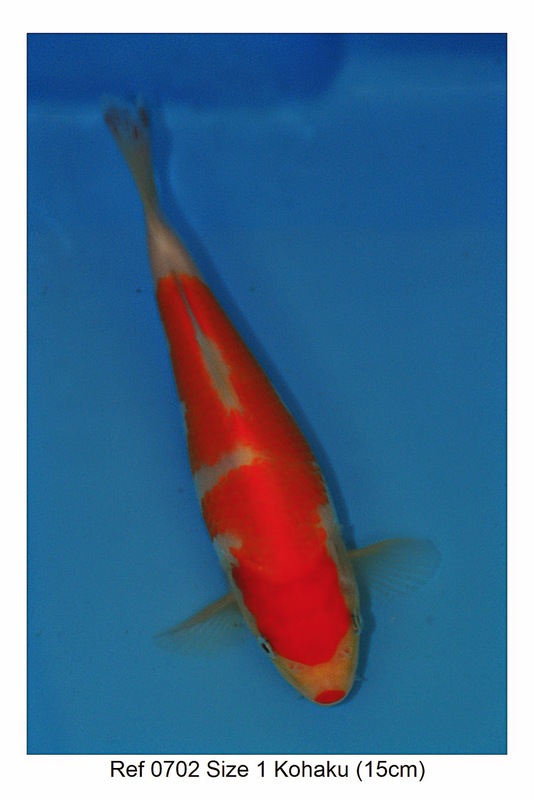 In terms of the dorsal - the first picture of this koi from second selection shows the rear half of the dorsal as being red - and now the edge of the dorsal is white along it's enture length.I cant find the hi res version of the first pic to be able to look more closely and confirm the first observation. Or whether the edge of the dorsal was always white along the full length, and it's just an aspect of the angle of the fin / situation of the first photo that means I can't conclude on this point. Something to track on other case studies - and perhaps we'll have to wait until the 2015 spawnings when I will have this characteristic in mind when I take pics of the koi at this early stage. Size wise - I remember this was one of the larger ones at second selection, but is in the middle order length wise now, and in terms of overall volume - again, probably middle order. Some of the longest koi (35 - 38cm on 7th feb) and the medium length (30-34cm) ones, have filled out more than the other koi their length. This koi has not done so yet. The white break between 1st and 2nd dan markings - in the first pic, there's a clear white line splitting the two patches of red. ok, the white line is less clear on the koi's right hand side - but it's still there. I remember at the time that I thought the gap would widen. The opposite has happened. The gap on the koi's right side has completely filled in. And - on the koi's left side, the gap has remained but there's a small area where the gap is narrowing. 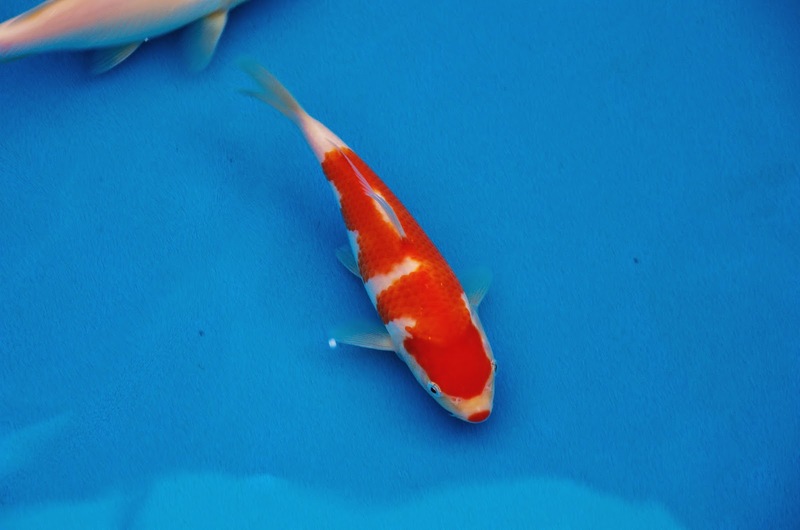 Another point to share is that I entered this koi into the Kangei Garden Show in early september 2014 and it came 2nd out of 3 koi in size 1 kohaku. One of my other koi came 1st, and the koi that came 3rd belongs to someone else. So, this koi has beaten one other koi (of japanese origin, I'm told by the owner) to place second. 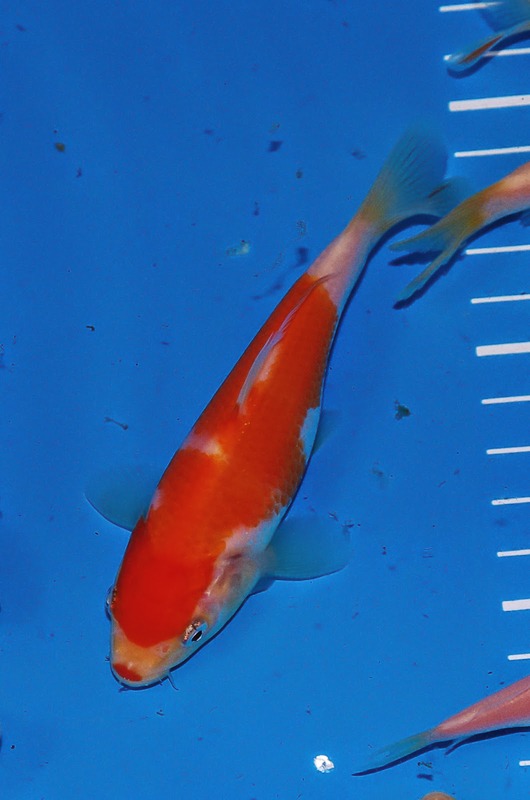 Back in September 2014, this was one of my best few koi from the May 14 spawning. So that's the story so far with this koi. 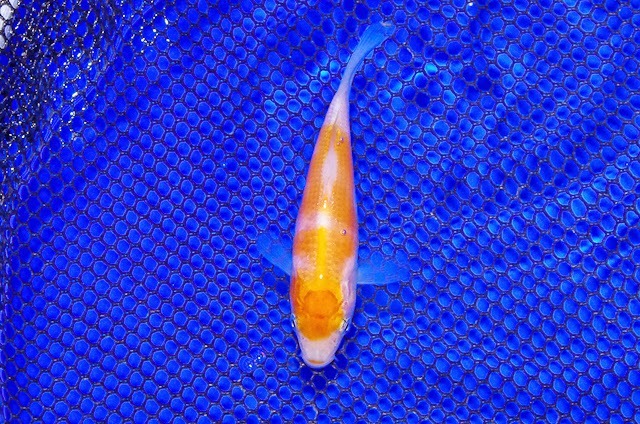 On 7th feb selections, I've decided to hang onto this koi until the next selection, probably in May. 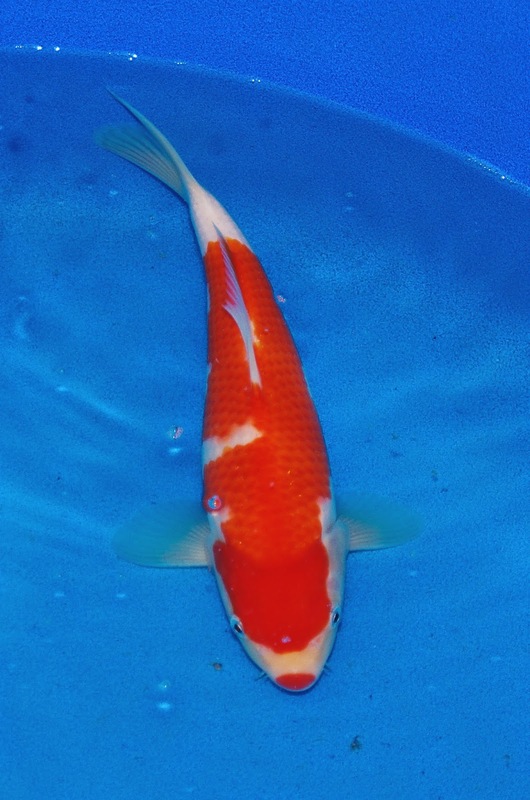 Of interest will be how the white gap on the koi's right hand side changes and also how the body develops.